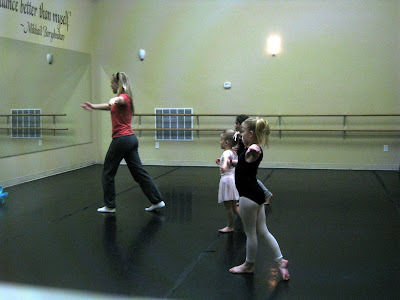 Forgive the quality of these pictures, but I couldn't resist taking some pictures of Jade in her dance class. She did such a great job of following Miss Alexis. She really tried hard to do everything she was told to do. While Miss Alexis was working with the other girls, Jade practiced the dance they are learning for the recital. This is the fifth time we've attempted to get Jade in dance. The first time was at Jackie Colledge Ballet, for a summer workshop. She loved it and did it with Asher. 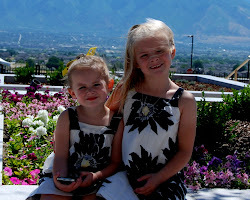 Then she did the BYU Children's Dance Theater. She loved the creative dance class, but after she fell during the recital, she didn't want to go back. The next year we tried a dance class at my friend's studio. She didn't enjoy the class and the other girls were not very nice to her, so she quit mid-year. Then in the summer she took the ballet workshop again. She loved the dance class but wasn't willing to give up karate or gymnastics to add dance class. I don't mind taking her out and putting her back in when she asks, but now that she's back in, I hope she wants to stay. She's very good and looks adorable doing it.